This vehicle has NO RUST on it whatsoever. It has NEVER been wrecked. The paint is original and is in EXCELLENT condition. The interior is PRISTINE, with the exception of the bench seat which has worn section where the driver sits and the front door panels where the stereo speakers were installed. Since the body / paint / interior combo is more or less flawless there was no reason to disturb it. However, the Cadillac 429 c.i.d. engine and Turbo 400 transmission, even though in operating condition, were tired and no longer complemented the great look of the vehicle. A complete overhaul was required. This is where I applied my custom touches. Kelly's Block and Machine [ 12910 W Washington Blvd, Culver City, CA 90066 — (310) 306-6795 ] for crack detection through the magnaflux process. The cost of the magnaflux service and cleaning the block / cylinder heads might be “ gone with the wind ” if cracks are found in the castings that are either not repairable or a crack repair is not advisable for the castings in high performance applications. The bottom line: it is better to be several hundred dollars out-of-pocket than several thousand dollars. The block and cylinder heads must be absolutely clean for the magnaflux process and one does not receive a refund if a casting is found to be beyond repair, however it is better to know what the integrity of the castings are before investing substantial cash and time in them; and this holds true even if the engine operated normally prior to disassembly. In the case of this 429 all checked out ok and the castings were retrieved from the machine shop so I could de-flash and prep them for the interior Glyptal coating and exterior paint applications. Compression ratio was left the stock 10:1 and new forged pistons installed. Exterior surface of engine block / cylinder heads were sanded to a smooth surface finish prior to application of the engine enamel. The proper color Cadillac Blue high-temperature engine enamel for the vehicle year applied to each component separately prior to assembly. Installed dual remote engine oil filters with capability to add oil lines for an after-market oil cooler at a later date. The remote filters are mounted aft of the engine to eliminate “ oil-catching ” by the sub-frame when oil filters are replaced. Due to it's superb insulating properties, manufacturers of alternators and starters worldwide use the Glyptal coating exclusively on the wire windings of their electrical components. In the 1920's General Electric developed the first commercially available polyester called glyptal for use as sealing agent and from this research came alkyd ( oil-based ) paints. Electrical windings coated with Glyptal in machinery can withstand arcing voltages in excess of 1500 volts for each mil thickness even while submerged in salt water! Glyptal is an awesome coating which surpasses paint, such as Rust-Oleum ®, hands down. The intended use of Glyptal ( PRODUCT CLASS : Red Insulating Enamel. MATERIAL SAFETY DATA SHEET CODE IDENTIFICATION: 1201A ) is to insulate electrical components. However, many professional hi-performance engine builders discovered long ago that Glyptal seals the tiny pores in metal and leaves a smooth, oil and acid resistant finish. This greatly assists in keeping the engine oil clean, free flowing and virtually impervious to sludge formation. The importance of both natural and synthetic polymers in our lives cannot be overestimated. The desirable properties of these macromolecules, such as tensile strength and flexibility, make them extremely useful both in nature and in the manufacture of products that we use on our vehicles nearly every day. Examples of naturally occurring polymers include such things as wood, cotton, paper and silk as well as proteins and DNA. Plastics, Teflon ®, Plexiglass ™, and Mylar ™ are all examples of commercially available synthetic polymers. These polymers are made up of smaller repeating units called a monomer and they are linked together by covalent bonds. The polymerization method by which polymers are synthesized fall into two categories. (1) — Addition Polymers are formed by addition reactions that link together the monomer(s) containing multiple bonds. One example of this process is the polymerization of styrene to form polystyrene. Polystyrene is used in molded plastics and as a foam insulator. (2) — Condensation Polymers are formed by linking together monomer(s) with the release of a smaller molecule, such as water or hydrogen chloride. 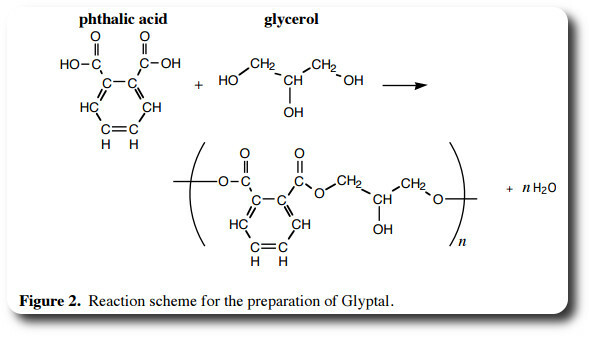 An example of this type of polymerization is the formation of a laminating resin called Glyptal from the reaction of glycerol and phthalic acid. The molecule that is eliminated in this case is water. Glyptal has an additional feature, it's properties can be modified by a process known as the crosslink. A crosslink polymer is formed by joining the long chains of molecules to each other by a covalent bond. 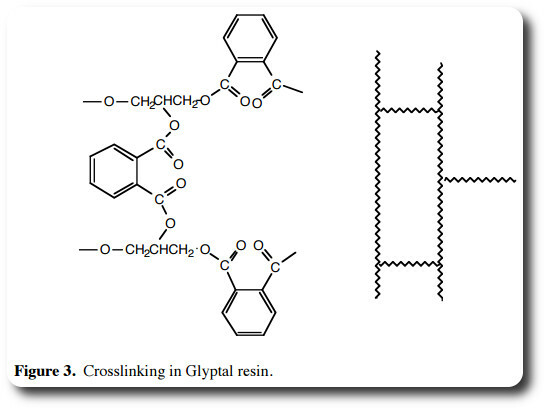 The link that is formed in Glyptal is shown below in Figure 3, along with a diagram which illustrates the crosslink of several polymer strands. The properties of this polymer change after the crosslink so that it becomes irreversibly hardened. This is the science behind the reasoning that Glyptal surpasses paint, such as Rust-Oleum ®, hands down, for use inside an engine block. It is possible to modify the properties of many polymers by generating such a crosslink.